← Is there a Future to Skiing in the Adirondacks? It keeps striking me how we seem to hit 50+ degree temperatures every week this winter, so I checked it out. Here’s a plot showing hourly temperature data at Central Park and La Guardia. Not only have we hit 50+ every single week all winter, there’s also an interesting periodicity to the data. 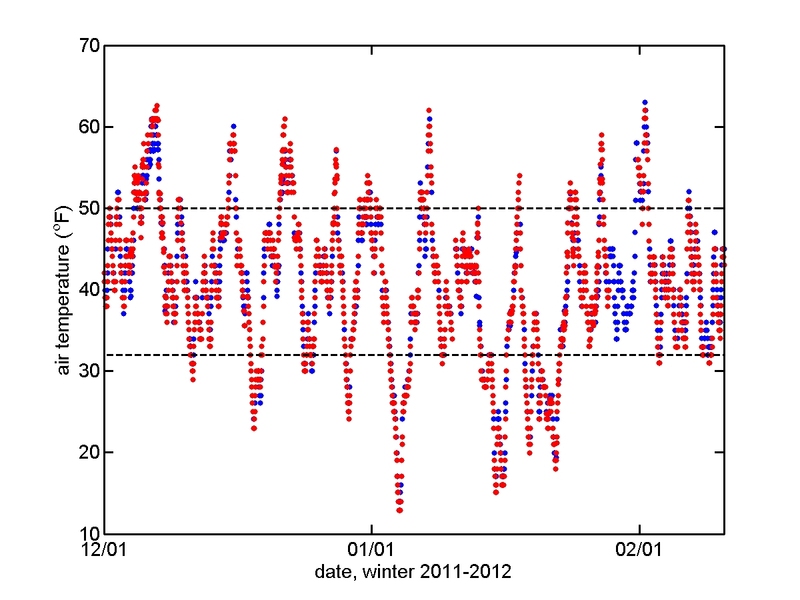 Air temperatures from December 1st, 2011, through February 10th, 2012, measured at Central Park (red) and La Guardia (blue). Also shown are horizontal lines marking the 50-degree and 32-degree mark (freezing). Data from NYHOPS, http://stevens.edu/NYHOPS . The periodicity is caused by weak weather systems pushing through the US northeast, presumably riding on periodic north-to-south waves of the jetstream. These systems bring cooler air but but the colder arctic airmasses have been trapped up north this year, unlike the winter of 2010-2011. Also, it hasn’t dropped below 30 degrees in three weeks, though that’s changing this weekend. Obviously the ground can’t freeze when it barely gets down to 32 at night, so it’s no surprise that we have shoots sprouting in the core of “winter”. Many weeks have even hit 60+ degrees. The latest forecast finally suggests we’ll have a full week or more without hitting 50 degrees F, though there’s a chance, with forecasts highs of about 47-48 by the end of the week. This entry was posted in climate, weather and tagged 32 degrees, 50 degrees, Central Park, cold, freezing, ice, jet stream, La Guardia, New York City, warm, winter. Bookmark the permalink. I bike commute about a 40 minute ride and so I’m pretty sensitive to the weather. The heavy snows of the last two years stopped me for a month or so in winter. And the potholes from all the ice last year were brutal – my bike cracked by summertime and I had the frame replaced! Very happy about the nice weather here, too!